Dhoni once again proved why he is captain cool. With 51/3 and young Virat Kohli on the other end Dhoni came on and made sure that India wins. This is the first victory for India in this tri-nations tournament after loosing against Srilanka. In what turned out to be an off-day for Indian bowlers Bangladeshi batsmen scored 296/6 out of the allocated 50 overs. With three quick wickets of Virender Sehwag; Gautham Gambhir and Yuvraj Singh falling for just 51 runs on board the indian team was certainly under pressure. But Mahi* (101 of 107 balls) and Virat (91 off 102 balls) with their 152 run partnership and later Raina* (51 off 43 balls) stopped the blood flow and crossed the line. Dhoni was aptly awarded M.O.M for the match. Pls read below for his post match speech experts. On Indian bowling: "It was quite disappointing that all the bowlers did not perform well today. Not a single frontline bowler was upto the mark. Only Yuvraj Singh (1/33 from 10 overs) bowled well. We cannot take Ravindra Jadeja as a frontline bowler but he bowled well,"
"If we want to be in the number one spot, if we want to be consistent then we need to improve our performance in all departments, especially bowling. I want the bowlers to deliver when needed." On Shakib al Hasan's decision to bat first: "I was surprised that he opted to bat. In the first two matches whoever had won the toss had opted to bowl first because everybody knows dew will play a major role in the result,"
On the 297 target: "Bangladesh scored nearly 300 and they got early breakthroughs as we were down 51 for three. We were under pressure. Virat and I were a bit nervous. But Virat played a superb innings and Suresh (Raina) supported us,"
"I was never really worried as we had the second powerplay in hand. We were never really short of runs. We were always in reach of the target. So I and Virat decided to build up a partnership to lay the foundation and the plan worked,"
On Kohli's 91 run knock: "He has grabbed whatever opportunity has came his way. It is difficult to make way in the Indian middle order be it in Tests or ODIs. He is putting pressure on the established middle order players. That is good sign for Indian cricket." On his performance and floating batting order: "I am happy that I scored a hundred under pressure and it came in a winning cause. Batting as a floater has benefits. For example, you come to know of the pressure of batting at different positions. A batsman batting at number three does not know the pressure of batting at number six or seven or vice versa. So it helps you adjust to different roles." On advancing the game by 30 minutes: "We had wanted starting the match by 11.30 am (local time) or 12 pm. Advancing by just 30 minutes will not make much difference,"
On Bangladeshi captain Shakib al hasan's remarks that Indian team relies on individual effort rather than team effort: "That was a wrong tag given to us. It is not like that. Of course, individuals have to contribute for the team. It is not that only a few individuals contribute for a win. I contribute for the team and then Virat and Raina chipped in,"
I hope you enjoyed the game. 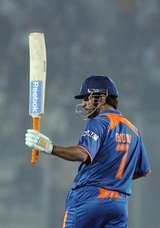 Click here to see the Indian innings highlights to watch the Dhoni's flashy bat and also make sure to comment.